Instructor presence in online courses is crucial for student success. The instructor plays an important role in student satisfaction in online courses. SHSU Online instructors interact with students in discussions, virtual office hours, feedback, and other important ways. One facet of instructor presence in online courses is feedback for the student’s submitted activities/assessments. Most of this instructor feedback has been textual in nature. Instructors generally type in their comments and try to personalize the text they use when doing so. For some time now, Instructors have had the ability to provide feedback with other tools (audio/video/etc. ), but it has been a kluge. Recording a video somewhere else, selecting a mash up, or pasting embedded code in the appropriate place was how more personalized feedback could be given. One of Blackboard’s latest feature releases allows instructors to record and insert an audio or a video recording right into the feedback area for a Blackboard gradable item. Watch this short video to learn how to provide audio and/or video feedback to your students seamlessly with the Insert Recording tool. Make a list of your students and decide how many times you will leave video or audio feedback during the semester. Use check-boxes to keep track. Select a small number of activities where you will provide this more personalized feedback and use the tool on them. Much like the ever-elusive Bigfoot or the Loch Ness monster, the ability to keep track of attendance in Blackboard was a quarry that had been long hunted. For years, Blackboard instructors have desired the ability to keep track of attendance in an official way via the tool where they spend most of their time. Thanks to our update to the Q2 2018 release of Blackboard Learn, we now have the ability to Mark Attendance in Blackboard Learn. The Attendance tool can be accessed via the Course Tools menu in any of your Blackboard courses. View this Blackboard how-to for accessing the Attendance page. Meeting View – This is where you mark the students’ attendance. Overall View – Allows you to mart attendance, track attendance history/statistics and create new meetings. Check out this tour of the Attendance page for more information. You can view attendance in the Grade Center though you can’t mark attendance. Students’ accumulative attendance scores always appear out of 100 points. Once you use the Attendance tool, you can’t delete the Attendance column, but you can hide it from your view. Now that we have captured this elusive prey, let us know if you have any questions about the tool and how it is used. This summer, Blackboard’s annual eLearning mecca, Blackboard World, can be found in Austin, Texas from July 23 to July 25. For those that have not had the benefit of attending a Blackboard World, it is one of the biggest eLearning conferences of the year. The fact that it is taking place in Austin this July, makes it much more convenient for travel and professional development budgets. Attendance at this years’ event will allow you to become more familiar with technology and tools already in place at SHSU and learn how other instructors and institutions are improving the learner experience. You can attend tailored conference sessions specific to higher education to gain valuable techniques for creating richer, more dynamic courses for your learners. See the links below for the Blackboard World website, #BbWorld19 Registration and how you can present at #BbWorld19. Members of the SHSU Online team will be attending and hopefully presenting this year, so you can lean on us for any questions you have about the conference. If you plan on attending, we advise packing walking shoes and mobile chargers. Walking shoes because there are so many sessions to chose from and mobile chargers because your mobile devices will be busy sharing all of the great things you learn while at #BbWorld19. Did you know that instructors can allow students to rate each other’s posts in Blackboard discussion forums? It works the same way that one would rate movies, books, apps, and things purchased in an online storefront like Amazon. Turning on the ability to rate discussion posts can be an additional way that online instructors increase student engagement levels. Any time you add or edit a blackboard discussion forum you can turn on the feature that allows members to rate discussion posts. If you have existing forums in your course, here are the steps to enable peer rating. Access the Forum Settings section close to the bottom of the Edit Discussion Forum page. Check the Allow members to rate posts checkbox and click Submit. Notice the Your Rating text with 5 blank close by. Choose the number of stars that approximates your rating of the discussion forum post. Note: Once a post has been rated, the Overall Rating will appear whenever the discussion forum post is displayed. Hopefully, following these steps will add a layer of peer evaluation to your course as well as promote more student engagement. *New for April – See our descriptions at the end of this post. Enroll in one of our faculty development sessions today! These sessions can be 5 minutes to an hour and can take place in your office, ours, over the phone and online. Use the same link to sign up for face-to-face or one-on-one sessions. Just select a topic or come up with one of your own and we’ll do it! 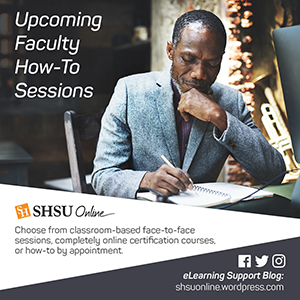 Visit the SHSU Online Faculty Development How-to Session page and schedule a one-on-one with a member of the Instructional Technology Support Services team. Kaltura has released an update for its interactive video quiz tool. For over a year, Kaltura has had the ability to create interactive video quizzes from any video you create or upload into your “My Media” area in Blackboard. Kaltura has updated this tool with an easier to use editor and the ability to sync quiz grades to your Blackboard Grade Center! Create an extra credit column in the grade center with a maximum score of 0 that is included in the default Total computation. Assign extra credit points as needed. Select Score for primary display. Select Percentage for secondary display. The extra credit appears in the Grade Center. When you add points in an extra credit column, a student’s total points can equal more than 100 percent. If a student receives full credit for all gradable items (100 points) and receives six extra credit points, the result is 106 or 106%. The weighted total column generates a grade based on the result of selected columns and categories, and their respective percentages. When you create a weighted column, you can include other calculated columns and other weighted columns. Your options are to add extra credit points to a category or to the overall grade. You want to add 5 points extra credit to tests. In the Grade Center, create an extra credit column worth 0 points. After adding the 5 points for each student to the extra credit column, create another column to calculate the combined test grades total. The “Tests Total” column includes any columns that include test grades and the extra credit column. When you create the weighted total column, instead of adding the category “Tests” worth 20%, add the “Tests Total” column for 20%. Create another column to calculate the total of the tests columns and tests extra credit column. Select Percentage for primary display. Create a “Final Total” column that includes the “Weighted Total” and the “Extra Credit” columns.